Outstanding textbook designed for courses in surface mine design, open pit design, geological excavation engineering and in advanced open pit mine planning and design. The step-by-step introduction to mine design and planning enables a fast-path approach to the matter by undergraduate and graduate students. The excellent, user-friendly software guides the student through the planning and design steps, and the drillhole data sets allows the student to practice the described principles in diverse mining properties case examples. The large number of illustrative examples and case studies, together with the exercises and the reference lists at the end of each chapter, provide the student with all the material needed to study effectively the theory and application methods of open pit mine planning and design. 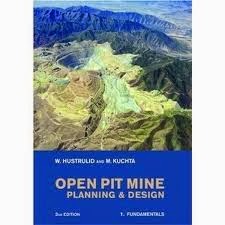 Volume 1 deals with the fundamental concepts involved in the planning and design of open pit mines. Subjects covered are mine planning, mining revenues and costs, orebody description, geometrical considerations, pit limits, production planning, mineral resources and ore reserves, and responsible mining. Volume 2 deals with CSMine, a user-friendly mine planning and design software that was developed specifically to illustrate the principles involved when applied in practice. It includes CSMine software, a CSMine tutorial, a user’s guide and various orebody case examples. Although intended as student course material, many practitioners have used it as a practical reference guide.